This coming weekend Nate and I are planning a trip to Austin for our 3 year anniversary. It's about a 4 hour drive from where we are but we're thinking about taking a train! i'm so excited! We've been wanting to go back for quite some time now. Austin was a very special place for us when we were younger. We spent a lot of time there together in high school on theatre trips and it was amazing, magical, lovely, inspiring, dreamy...( i could go on and on). I've also always wanted to take a train ride somewhere. We're hoping to eventually move there one day so this trip is much over due. I'm making a mental list of the "musts" while there.. it'll probably only be a weekend trip so we'll be a bit limited. any suggestions? 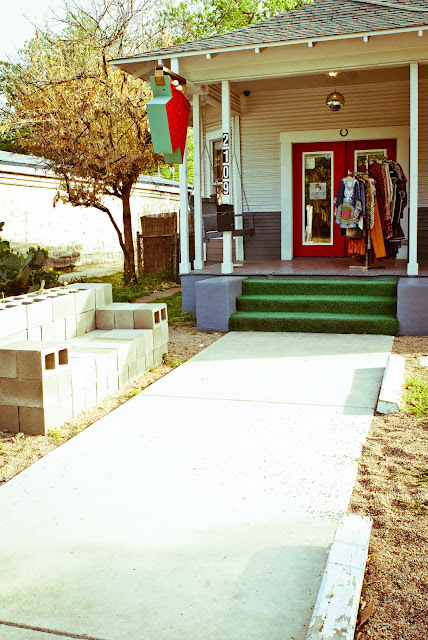 I know I'm definitely going to be doing some serious vintage shopping and thifting on SoCo street (South Congress). Especially Charm School Vintage(I WANT EVERYTHING ON THEIR BLOG!!!! ), Uncommon Objects and Blue Velvet. also, have you ever heard of Toy Joy??? word on the street is its phenomenal. Do you SEE that array of robot toys? omg. there are also a few design/art shows going on that id love to talk nate into going to but we'll see. im reading to hop the train. =) tata for now guys. Austin's one of the places I'd love to visit some day, it looks very classic but also there seems to be so much going on there!